We have seen the Ravens defense get shredded by Peyton Manning. We’ve seen the offense stall against the lowly Browns. Now we have seen a definitive team win over a good Houston team. Baltimore might still be trying to sift through some injuries to find its identity, but the one constant across all three games has been trouble with the offensive line. According to Pro Football Focus grades, the Baltimore Ravens have the worst offensive line in football. For 2013, the Ravens return Bryant “Birthday Boy” McKinnie, who solidified the o-line for the playoff run. He was crucial to Joe Flacco’s success last postseason. Kelechi Osemele, one of the top rookies in the league, poised for a strong sophomore campaign. Then there is Marshall Yanda who is an All-Pro at right guard, and Michael Oher who has shown he can hold his own as a right tackle. Just don’t put him on the left side. They start a second year center in Gino Gradkowski following the retirement of Matt Birk. It’s hard to believe this unit could be so bad, but the numbers and our eyes don’t lie. PFF grades for overall performance are cumulative grades. 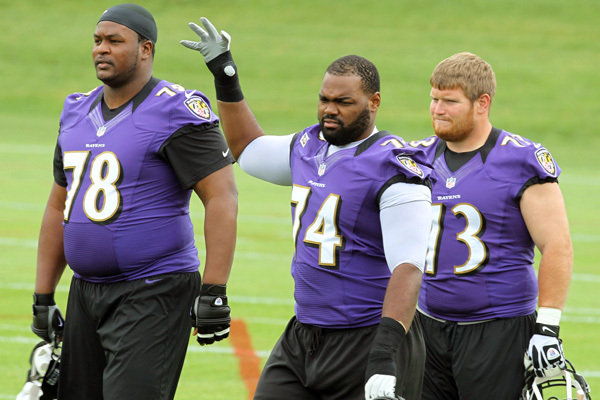 The Ravens finished the 2012 regular season with a 14.6 mark in pass blocking, 17th in the NFL. They posted a 14.0 mark in run blocking, 11th in the league. Those numbers are somewhat skewed because it includes every player involved in blocking like wide receivers and even quarterback, Joe Flacco. For this exercise, I’ll isolate just the offensive linemen, fullbacks, tight ends and running backs. Their grades include pass blocking, run blocking, screen blocking, and penalties. Marshall Yanda, no surprise the best on the line with a 10.6 is pass block, and 14.8 in run block. Vonta Leach actually bested Yanda in run block with a 16.2 mark. Matt Birk was the most polarizing figure with a below average -5.8 in pass block, but above average 7.6 in run block. Ed Dickson is your worst run blocker at -8.9. A guy they liked for his run blocking ability, opposite the pass catching Dennis Pitta. Mind you this is a cumulative grade. 16.7 over four games would have put them on pace for a 66.8 grade over a 16 game season. This is the effect Bryant McKinnie made in his return. The entire offensive line posted positive grades in pass block, even Matt Birk, overcoming that -5.8 in the regular season, with a 1.8 in the postseason. (McKinnie 1.0, Osemele 2.2, Birk 1.8, Yanda 3.7, Oher 4.5) Michael Oher did have trouble in run block with a -11.1 grade, and Dickson was below average in both pass and run with marks of -1.3 and -6.1 respectively. That’s not a typo. -35.3. This unit is nearly as bad as they were good for an entire season a year ago. Close to complete 180 and then some if they don’t turn it around. Marshall Yanda is the only player with good grades at 2.9 overall. As far as run blocking, the ones not specifically pulling their weight are Vonta Leach (-2.2) Gino Gradkowski (-2.4) Bryant McKinnie (-5.2) Ed Dickson (-5.7) and Michael Oher (-6.3). Osemele has been average in run block, but poor in pass protection with a -4.1 grade. He had a 1.5 grade in that area last season. Gino Gradkowski is in fact the weak link here, with an overall grade of -7.7. His nine pressures allowed of Flacco is the second most for a center behind Ryan Wendell with 10 in New England. Also worth noting that J.J. Watt posted a 7.0 in run defense grade against our O-Line. The best grade he’s received in his career. As a team, the Ravens were 17th and 11th last season in pass and run block respectively. So far in 2013 they are 27th in pass block (-10.4) and dead last in run block (-24.3). The 2013 offseason was heavily focused on the improving the defense. I can see where the Ravens brass should focus its attention in 2014. Ed Dickson and Michael Oher are free agents after this season. Do you let them walk? Or unlike former Ravens Paul Kruger and Dannell Ellerbe, will the performance by these two not price theme out of Baltimore and can they still be better than an unknown alternative?